Welcome! This site is by and for the folk and pedal harp players of Montana and surrounding states (yes, they do exist!). Here you can find players in your area, harp lessons, harps for sale, upcoming harping events and performances, and much, much more. Keep stopping by, as there will always be something new to find! 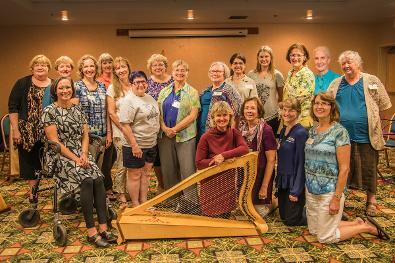 The Big Sky Harp Society was formed in September of 2012 during an exciting weekend retreat for harpers and harpists around the state. Living as a harp player in Montana has its unique challenges, as this is a very large, sparsely-populated state, but we are thrilled to form this free society to promote the harp, provide connections, facilitate harp events and training, and just have fun together! If you are interested in joining, contact us here. Our purpose is to facilitate connections among harp players, provide training in workshops and retreats, and just plain have fun!